sarawestermark: Lark Books Used my Rings on their Call for Submissions! Lark Books Used my Rings on their Call for Submissions! Last Wednesday I got a call from Lark Books requesting some photos for an upcoming press release to announce a "call for submissions" for their latest 30-Minute Ring Book. I was thrilled to let them use photos of my work and very humbled as well. I don't know about you, but I have to work quickly to get things done in the studio. I have a family of three with my youngest still at home, so needless to say, I've been working with mastering the 30-minute challenge! Lark Books is challenging metalsmiths and jewelry designers to submit designs for their newest book in the 30-minute Design Series. "We challenge you to design a ring that can be made…start to finish…IN 30 MINUTES FLAT. Artists exceeded expectations by submitting stunning work for 30-Minute Earrings and 30-Minute Necklaces, the first two books in this series. Now we ask you to join the fun! Winning jewelers will be paid to create their designs. 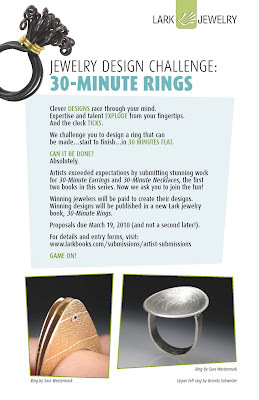 Winning designs will be published in a new Lark jewelry book, 30-Minute Rings. Proposals due March 19, 2010 (and not a second later!). For details and entry forms, click here.